When they do occur, Emmons keeps his job interviews straightforward, recognizing actions often speak louder than words. His company looks at the applicants; then if someone seems like a good ft on paper and in person, they are sent to the job foreman for another interview. If a position is ofered and accepted, a trial period begins. "You seem to know a person's work habits within three months or so. If he shows up all the time, on time and willing to learn, he is a keeper," he says. "You would think that sounds simple enough, but it is harder to fnd these people than you would think." 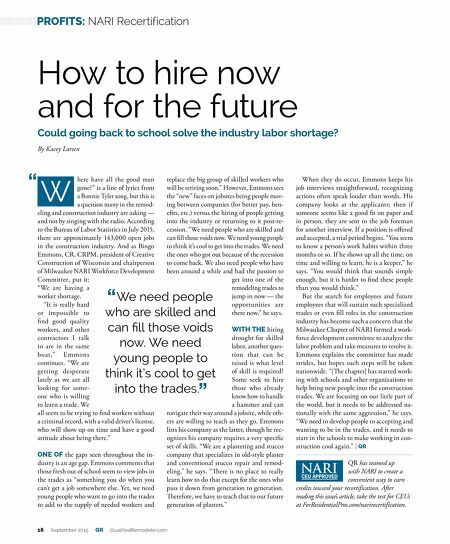 But the search for employees and future employees that will sustain such specialized trades or even fll roles in the construction industry has become such a concern that the Milwaukee Chapter of NARI formed a work- force development committee to analyze the labor problem and take measures to resolve it. Emmons explains the committee has made strides, but hopes such steps will be taken nationwide. "[Te chapter] has started work- ing with schools and other organizations to help bring new people into the construction trades. We are focusing on our little part of the world, but it needs to be addressed na- tionally with the same aggression," he says. "We need to develop people to accepting and wanting to be in the trades, and it needs to start in the schools to make working in con- struction cool again." | replace the big group of skilled workers who will be retiring soon." However, Emmons sees the "new" faces on jobsites being people mov- ing between companies (for better pay, ben- efts, etc.) versus the hiring of people getting into the industry or returning to it post-re- cession. "We need people who are skilled and can fll those voids now. We need young people to think it's cool to get into the trades. We need the ones who got out because of the recession to come back. We also need people who have been around a while and had the passion to get into one of the remodeling trades to jump in now — the opportunities are there now," he says. WITH THE hiring drought for skilled labor, another ques- tion that can be raised is what level of skill is required? Some seek to hire those who already know how to handle a hammer and can navigate their way around a jobsite, while oth- ers are willing to teach as they go. Emmons lists his company as the latter, though he rec- ognizes his company requires a very specifc set of skills. "We are a plastering and stucco company that specializes in old-style plaster and conventional stucco repair and remod - eling," he says. "Tere is no place to really learn how to do that except for the ones who pass it down from generation to generation. Terefore, we have to teach that to our future generation of plasters." here have all the good men gone?" is a line of lyrics from a Bonnie Tyler song, but this is a question many in the remod- eling and construction industry are asking — and not by singing with the radio. According to the Bureau of Labor Statistics in July 2015, there are approximately 143,000 open jobs in the construction industry. And as Bingo Emmons, CR, CRPM, president of Creative Construction of Wisconsin and chairperson of Milwaukee NARI Workforce Development Committee, put it: "We are having a worker shortage. "It is really hard or impossible to fnd good quality workers, and other contractors I talk to are in the same boat," Emmons continues. "We are getting desperate lately as we are all looking for some- one who is willing to learn a trade. We all seem to be trying to fnd workers without a criminal record, with a valid driver's license, who will show up on time and have a good attitude about being there." ONE OF the gaps seen throughout the in- dustry is an age gap. Emmons comments that those fresh out of school seem to view jobs in the trades as "something you do when you can't get a job somewhere else. Yet, we need young people who want to go into the trades to add to the supply of needed workers and How to hire now and for the future Could going back to school solve the industry labor shortage? By Kacey Larsen W We need people who are skilled and can fll those voids now. We need young people to think it's cool to get into the trades. 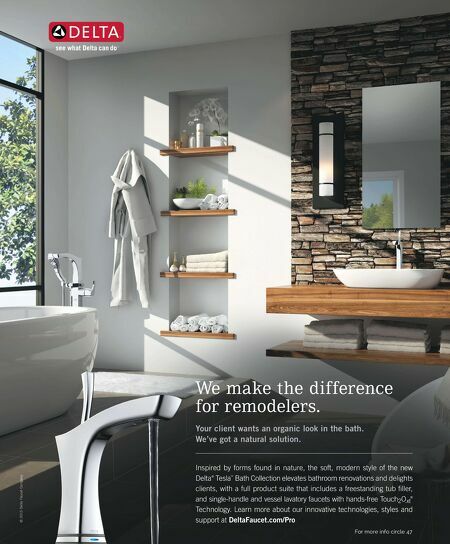 16 September 2015 QR QualifiedRemodeler.com PROFITS: NARI Recertification QR has teamed up with NARI to create a convenient way to earn credits toward your recertification. After reading this issue's article, take the test for CEUs at ForResidentialPros.com/narirecertification.